Last week I wrote about the science and how far it’s progressed. This week I wanted to reflect on how Maggie has changed, how much she has accomplished, how Rett Syndrome continues to affect her and how she continues to push back. A year ago she was barely making any sounds at all. We started thinking we would never hear her voice again – but she’s really started to find a voice of late. She can’t speak, and doesn’t use any words. But living through it, we take any vocalization at all as a victory. She’s been playing the screaming game – where she will scream, with a smile on her face, and wait for us to scream back. It’s not talking, but it is communication and I’ll take any step in the positive direction. Heck, a year ago, we had just received her eye gaze device and now I can’t imagine what we did without it. She’s occasionally navigating through pages and looking for the things she wants to say, using it appropriately and impressing us with how she uses. It’s still a work in progress. They haven’t seen very many positive results at school and we see less positive results at home than we do at her speech therapist’s. Hopefully that’s just her learning how to communicate with multiple communication partners. Her breathing has gotten worse and while we couldn’t even imagine what “breathing issues” were that we hear so many families struggle with a year ago- now we know it all too well. She is more or less constantly sucking in air. It’s not because she can’t get enough oxygen, it’s because her brain isn’t automatically letting her breathe. It’s a struggle to watch and there is absolutely nothing we can do for it. A treatment for Rett Syndrome would address this, but there is no other medicine that we’ve found that would help. Her hand strength and function comes and goes. She is rarely without her two favorite toys, flicking them back and forth with one arm. However she rarely chooses to do much else with her hands. We have to remind her to use her hands to pick up a fork or food, move her hands for her for any art project, and help her squeeze her sippy cup with both hands. We’ve taken to bracing her almost all of the time now so she doesn’t hurt herself. Even so, she gives herself blisters from rubbing her skin so hard. Her gross motor skills have gotten better, though her balance is getting worse. She likes to fall backwards on stairs and in other less than safe arenas. I like to think of it as her playing a trust fall game without telling anyone about it, but really it’s just a loss of balance. That said, she is getting better at climbing the stairs and alternating her feet, both up and down. She still needs some assistance, but progress is being made there. She is getting better at walking across stepping stones and obstacle courses. Her core strength continues to impress and she can probably do more situps than either of us at this point. She needs to work on oblique strength a little, and hip strength in order to move on to the next phase of gross motor development – as climbing independently, sitting on the ground, and the like will continue to be difficult without building that strength. Her depth perception continues to be a struggle and though vision therapy is helping, it’s obvious the world isn’t quite clear to her. She listens when she chooses (like a typical 5 year old), but we would like her to pay closer attention (or attention at all) when we ask her to stop from running into the street, or really ask her to do anything that isn’t the thing she wants to do at that moment. Potty training continues to be a struggle for her as well. When she was 2 she was consistently going on the potty, at least for #2, though she would have some #1 accidents. Three years later, she’s less consistent. We’re trying to figure that out since, obviously, it would be better for her to have some level of independence when it comes to things like this. She’s growing nicely and still eating well, though she’s getting pickier and pickier. French fries have become a major part of her diet. We haven’t seen any real seizures yet (that we know of). She sleeps pretty well. We count our blessings that she’s happy most of the time. Though the times she’s inconsolable are extremely frustrating and stressful for us. 2015 was a year of change for us. I’ll probably refer back to this blog every year to see how she’s actually progressed. Trying to relay the information from memory will grow increasingly hard, I assume. And trying to relay it from reviewing the videos will be increasingly emotional, I assume. Two years in and it feels like we’re just now settling into what Rett Syndrome is and what it means for our family, and extended family. Though even that will continue to change. This entry was posted in Uncategorized and tagged maggie. Bookmark the permalink. lovely recap guys. you are always in our minds. Thanks for always keeping us updated. You are an amazing family! 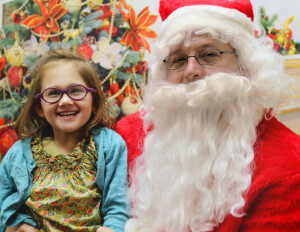 You must have been pleased to see that your daughter had a smile like this with Santa! Mine cried so hard; it was like she thought we were about to send her back to the North Pole with her “new dad.” On the plus side, she ate a french fry for the first time last week, and had a goofy grin on her face that as she ate it. (Fortunately, my wife captured that moment with the camera.) The love kids have for french fries is truly ageless. Hope you had a happy and merry Christmas and new year. Incidentally, how do you do Christmas presents with Maggie? Do you get her to unwrap boxes, or do you put toys in Christmas bags instead, so they’re easier to take out? She cried the first couple of years with Santa – we’ve figured out that if the photographer sings, she’ll smile at them no matter what, so now you know our secret. I hear you on the french fries. We were away for the last two weeks and I think Maggie had french fries with every meal. We do wrap presents and we start to rip the presents and then let her pull the paper more. Typically her body just wants her to escape, though on occasion there will be presents we unwrap that she does get interested in.